You are viewing an unapproved version. Rumgumption is a darkly whimsical, quirkily acoustic band poised between tradition and invention. 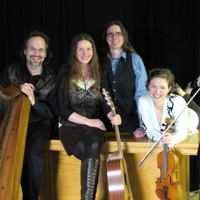 Rooted in Scottish/Irish traditions, Rumgumption’s music ranges from nautical to fantastical, historical to speculative. Shawn McBurnie, like many great traditional singers, is self-taught – inspired to learn by the time-tested combination of love of song and scarcity of entertainment. His obsession with voice was early and abiding; his passion for wordcraft came later but was no less tenacious. Shawn writes a quarterly article on Scots language use in song for Scottish journal The Kilt and Harp and teaches singing at the Center for Irish Music. Chad McAnally, 2009 National Scottish Harp Champion, is at the forefront of the continuing revival of the ancient wire-strung Gaelic harp. Chad surprises – both with his startling level of technical finesse and with the robust vigor of his sound. In Chad’s deft hands, the sound of the wire-strung harp, hammer dulcimer, and wooden flute is at once evocative of antiquity and exuberantly contemporary. Chad teaches harp and whistle at the Center for Irish Music in Saint Paul, MN. Dee Brust, guitarist and singer, has a keen ear for melody and breath. Producing full grown tunes from the keys of the defunct pianos of her youth, plucking chords out on mysterious basement guitars, Dee has joyfully exercised the will of her senses to express the music and poetry she wades through each day. Dee has been a favorite performer at the MN Renaissance Festival since her teen years and may still be found there carousing with her husband and four children.